I’ve been cooking a lot from The Kitchen Diaries: A Year in the Kitchen with Nigel Slater – I mean an awful lot! First for a Spoons dinner a few weeks ago and then on Saturday for my Mother Forkers dinner here at the house we all cooked recipes from any Nigel Slater cookbook and ate under the stars in the secret garden. I made his harissa chicken using two brick chickens from Lindy and Grundy that Didier grilled outside and some simple strawberry water ice – recipes to come I promise. The show stopping dish had to be Caroline’s Rhubarb and Sloe Gin Mess – simply divine. 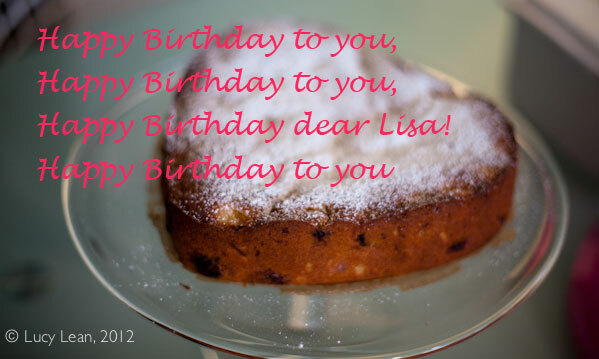 Then on Sunday it was my friend Lisa’s birthday and I decided to bake her a cake. I met Lisa in pre-natal yoga at Golden Bridge when pregnant with Minty and we instantly became great friends. The type of friend you really need during those tense months leading up to the birth of your first child. Minty and her son Hopper were born just under a month apart. I can’t believe that was 10 years ago. The pressures of having a son who is a great sportsman means Lisa has become a baseball mom – games and practices take up most of her time and we rarely see each other. Recently, we have made the effort to meet for lunch – boy do we laugh hard together. Always have and that’s one of the things I love most about Lisa – she laughs at almost anything – usually to do with something I have said, or the way I’ve said it. So as baseball has taken over her life – for her birthday she was at not one, but two little league games – I decided to take the party to her in the bleachers. I recently asked Slater what his idea of comfort food is he replied “A cake. Making a cake for someone takes time – that’s real comfort.” So I looked in Slater’s most recent book Ripe: A Cook in the Orchard , for a new cake recipe and came across the quintessential summer cake of raspberries and apricots. Sadly the apricots I had weren’t ripe and flavorful enough for this cake – I whipped up a great batch of apricot jam with them instead – and turned to the luscious white nectarine’s that were perfectly ripe – juice running down your chin and bursting with flavor ripe – that makes you fall in love with stone fruit twice over. Making Lisa a cake that isn’t a traditional spice cake was risky – she’s very picky around food. I tried not to tell her what was in it as I knew it would probably put her off. “Raspberries and apricots are rippled through the soft, almond rich crumb of this pretty cake,” says Slater. “The very essence of summer, I sometimes add a few rose petals and an extra handful of raspberries at the last moment, or perhaps a light scattering of caster sugar. The cake was light and delicately flavored from the fruit and deliciously buttery and moist from the almonds. The other baseball moms in the bleachers seemed to appreciate it. As we sat perched on the top row Lisa introduced me as the “English Martha Stewart” and I worried my precious glass cake stand might tumble down through the gap. The celebration confirmed two things – I’m a bad mum for not embracing Rémy’s desire to play more baseball (I signed him up for two weeks of baseball camp – but seriously? 2 practices and games every weekend?) and secondly, I know nothing about the game – it’s a run not a point, you get a run for going all the way around regardless of if it’s a home run, if they catch the ball the whole team isn’t out, there are 6 innings and there was something about shouting out a double nought – or was it a double knot? but that’s where I lost them. As always I came away feeling lucky to have Lisa as my friend – laughing with her is a tonic and I wish we would do it more often. 1. Line the base of a 9 inch springform heart shaped cake pan with parchment paper and lightly grease the edges with butter. 2. Pre-heat the oven to 350 F.
3. In an electric stand mixer cream the butter and sugar together until pale and fluffy. 4. Beat the eggs lightly then add, a little at a time to the creamed butter and sugar, pushing the mixture down the sides of the bowl from time to time using a spatula. If there is any sign of curdling, stir in a tablespoon of the flour. 5. Mix the flour and almonds together and fold in, with the mixture at a slow speed, in two or three separate lots. 6. 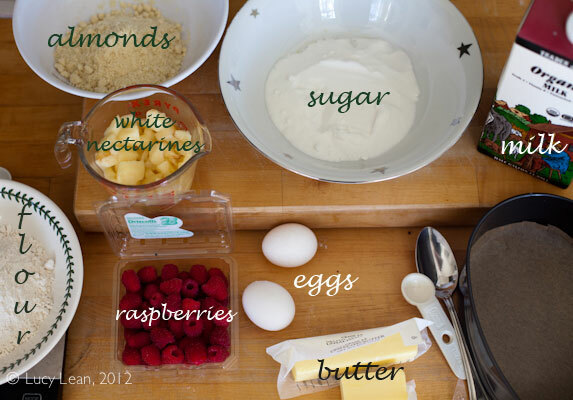 Add the milk, and once it is incorporated add the chopped nectarines and the raspberries. 7. Scrape the mixture into the cake tin and bake for an hour and ten minutes. Test with a skewer, if it comes out relatively clean then the cake is done. Leave the cake to cool for ten minutes or so in the tin, gentle release the cake from the pan and place on a cake stand. 8. Decorate with a light dusting of confectioners sugar, rose petals or more raspberries – as Slater says “as the fancy takes you”. I love the use of fresh fruit in this cake! birthday’s are always best with a homemade cake. you are a good friend, Lucy! This cake sounds so tender and wonderful! I love the addition of the ground almonds. The fresh fruit makes it perfect for the summer, tender and fresh. Lovely! Can’t wait to try it. Yum, the perfect way to celebrate. So light and fresh for summer!